So this is how we started Pockets of Hope for the Oklahoma tornado victims in our house. Everybody in our family has a bottle, and it has turned into a little competition to see who can collect the most change. So far, our change collection has come from carrying our bottles with us everywhere we go. 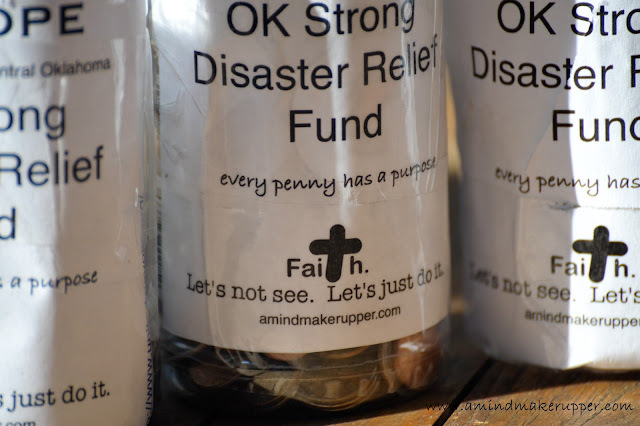 The idea to collect pockets of change to help others sounded great at first, but it has been harder for me than I thought to step out in faith that way. It turns out, I am terrible at asking people for money, even if it's loose change for a fantastic cause. On the other hand, my kids are really good at it. They seem to be naturally talented in this department (it's a little scary). They took their bottles to school and hit up their friends and teachers the last week of school, no problem. My husband put his bottle on his desk. One night, he forgot to take it home. The next day, it had an extra $10 bill inside! I am in last place in our family. I think I need to rethink my approach. 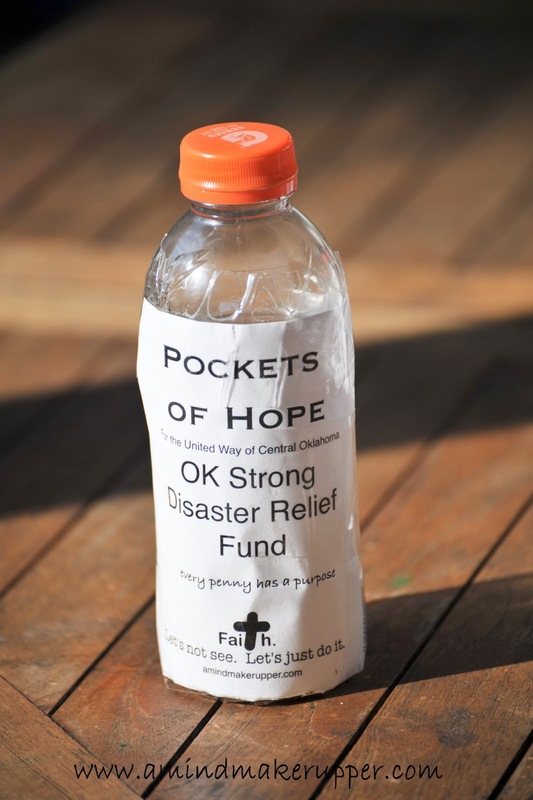 I don't know how much money we have raised at this point, but these five bottles are a few small steps in the right direction to reaching our $1000 goal for the OK Strong Disaster Relief Fund. This is another case in my life when my kids are teaching ME a thing or two. If you would like to help us reach our goal, we'd LOVE that (especially me since I haven't collected any money in my own bottle yet)! 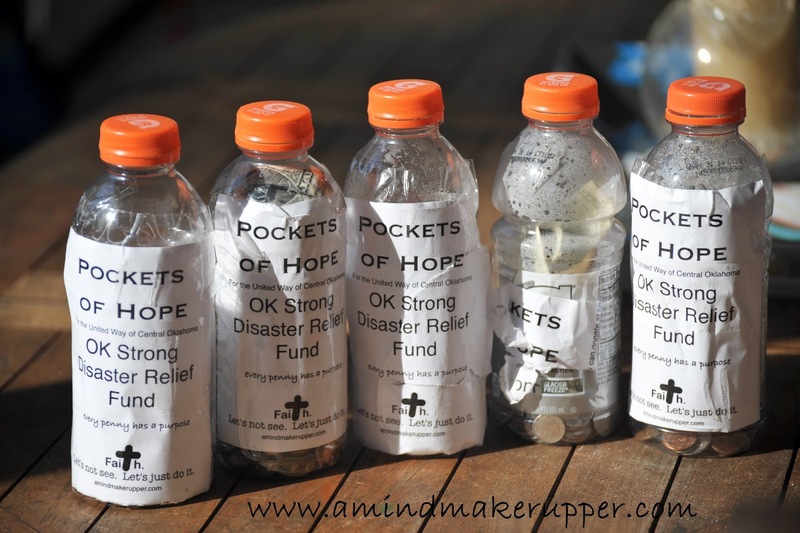 You can get all the details on how to help with Pockets of Hope by going to http://www.amindmakerupper.com/2013/05/just-do-it-ok-pockets-of-hope-for.html or you can come up with your own fundraising efforts and report your total donations for the OK Strong Disaster Relief Fund, by June 28th! My email is amindmakerupper@comcast.net. I am happy to help if you have questions. I can't wait to see what God does with our change! Thank you for Your word and for always keeping your promises. Today, I pray for your mercy and grace. Use our small steps of faith to do BIG things for Your kingdom. Lord, may our pockets of change help provide hope, love, and healing to the tornado victims in Oklahoma. Help us reach our $1,000 goal. I know that, with You, nothing is impossible.